In the Netherlands, retail chain HEMA has partnered with start-up ‘Too Good To Go’ through which it offers the ‘magic box’. The box contains surplus food that would usually have been thrown away at the end of the day. In Sweden, ICA is trialling the ‘Karma fridge’ in its ICA Kvantum Liljeholmen store. Hema customers can purchase the box via the Too Good To Go app and collect it from the nearest HEMA store. The original sales value for the box is €12 but it can be purchased for €4. The contents will depend on what products are left over that day. This project will be trialled in five stores in Amsterdam from November 2018. The selected stores are located on Ferdinand bolstraat, Gelderlandplein, Jodenbreestraa, Kinkerstraat and NDSM street. If the trial is successful, HEMA will consider expanding to other cities, though no locations have been confirmed. Meanwhile in Sweden, ICA has partnered with start-up Karma and will trial the ‘Karma Fridge’ in ICA Kvantum Liljeholmen until 31 December 2018. ‘Karma fridges’ provide a convenient storage and collection point for unsold food. 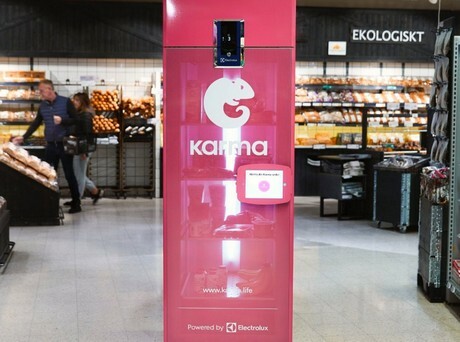 Retailanalysis.igd.com reports how customers can purchase this product from ICA Kvantum Liljeholmen via the Karma app, collecting it from the in-store ‘Karma fridge’. The fridge has a smart lock which only opens once a customer scans a QR code from their phone.